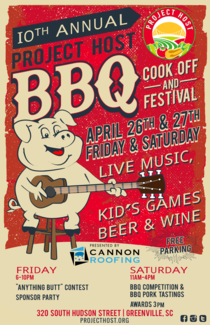 Please sign up below to volunteer at the 10th annual Project Host BBQ Cook-off and Festival to be held April 26th and 27th at 320 S. Hudson Street, Greenville; the site of the future Unity Park. Please contact [email protected] with any questions. I'd like to work as a cook!